Matt Samperi has performed in his share of light-hearted musicals during his first three years at Acton-Boxborough Regional High School. So when the Boxborough senior had an opportunity to take part in an acclaimed drama documenting the aftermath of the murder of a gay college student in Laramie, Wyo., he jumped at the chance. "I knew it would be an amazing experience and I wanted to be a part of it," said Samperi, who plays a bartender, Mormon Church leader, and a member of a theater company in the school's production of "The Laramie Project." "I knew it was a big deal." While Samperi was prepared for a challenging theatrical experience unlike anything he had encountered, he wasn't expecting the controversy that has surrounded the school's decision to put on the production, set to open at 7:30 p.m. tomorrow. 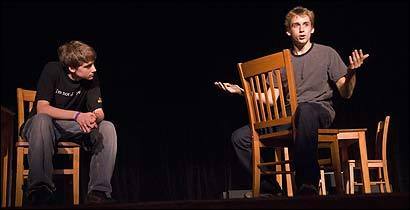 "The Laramie Project" is a play created by Moisés Kaufman and members of the Tectonic Theater Project about the reaction to the 1998 murder of Matthew Shepard. The play draws on interviews by the theater company with residents, published news reports, and journal entries from theater members. The script includes foul language, graphic descriptions of Shepard's murder, and examines whether it was a hate crime. Several parents oppose the play and have enlisted help from MassResistance, a gay opposition group, to get their message out. One of its members is Acton resident Amy Contrada, whose daughter is performing in the play. Parents, including Contrada, asked the school to halt the production, then organized a forum with speakers including a doctor who spoke about the dangers of sexually transmitted diseases and a former gay man who is now a Christian pastor, married with two children. The Westboro Baptist Church from Topeka, Kan., plans to picket outside the school an hour before Saturday's performance. The church, known for its anti-gay protests throughout the country, issued a press release announcing its plans. It said that God hates gays and people who support gays, and thus "God hates The Laramie Project, Acton-Boxbourgh [sic] High School, Massachusetts, and the U.S.A.."
Contrada wanted to make it clear that MassResistance is not associated with the Kansas church and will not be protesting before any of the productions. She said the group held the forum in October, well before the play was set to open, so that their views could be discussed in a calm setting. Before the opening of the show tomorrow night, Common Ground, the high school's gay-straight alliance, is planning a rally in support of the production. Acton Police Chief Frank Widmayer said he has been meeting with school officials for the past month to plan for any protests or rallies. He said he does no know exactly how many protesters will be there, but the department will be ready. Widmayer said the police will have different areas set up for protesters to keep groups separated. "We'll be there to keep the peace," Widmayer said. As of now, Widmayer said, the department plans to use only Acton officers, though the State Police in Concord will be on alert if needed. Susan Williams, assistant director of the play, said the students were told that the material has been controversial, but they were still caught off guard. "There has been some buzz," Williams said. "It took them by surprise a little bit. But the kids seem very excited. We're trying not to focus on the negative." Williams said the play has provided an opportunity for the students to work on different skills, such as performing in an ensemble, playing multiple characters, and reciting monologues. Unlike with other productions, students received background material on Shepard's murder and watched news clips so they would have context for the play. "The Laramie Project" has been put on at community theaters, colleges, and high schools across the country, many amid protests. Locally, Concord-Carlisle Regional High School, Lincoln-Sudbury Regional High School, and Newton South High School have all put on the play in recent years with little controversy. But in Acton, some parents have expressed concerns about the homosexual content of the play. Others say the foul language and violence are inappropriate for a high school audience. Cynthia Pierce, a mother of six from Boxborough, said she thinks the play is well-written and thought-provoking but not appropriate for a high school audience. Pierce said she asked the school administration to cut some offensive parts but was told it was not possible. Pierce said she wishes the high school had solicited opinions from parents before announcing its decision to put on the play so there could have been more public discussion. Pierce said that if more parents had read the script, they would have had second thoughts about the production. "Can't the lessons taught in this play be taught in a better, more age-appropriate manner?" Pierce wrote in an e-mail. "Does the value of the lessons taught in the play justify stooping to crude exposure? While I don't think we should shy away from controversy, I do think we all have an obligation to stand up for decency in our communities." Pierce said she had discussions with school officials but fears her message did not get across clearly. Some parents oppose the play because of the homosexual content and portrayal of Christians. "I feel my concerns were drowned out and not heard because of the louder, more extremist voices, but I'm not sure the school would have listened to me anyway," Pierce wrote. Contrada, who declined to discuss her daughter's involvement in the play, said one of her biggest concerns is for the safety of the students exposed to the play. She said gay activist groups have been in contact with the students and are introducing them to websites that promote dangerous lifestyles. "They are taking kids who are vulnerable and sending them to bizarre websites," Contrada said. "They are clearly directing the students toward the homosexual/transgender movement." The student performers say the opposition has come from a small group of parents, but much of the community has been supportive of the production. They think the play sends an important message about tolerance. "Homosexuality is part of the play, but I think the real message . . . is about acceptance and against hate," said senior Noah Simes of Acton, who plays a priest and a detective. "I think that anyone who is opposed to the play doesn't get its true message. If it gets people talking, it's done its job." Lura Chamberlain, a senior from Acton, said the controversy has added some excitement to the production. "I think ultimately the opposition is really going to make us stronger," said Chamberlain, who plays a friend of Shepard, a member of the theater company, and a Laramie resident. "It provides a real-life example of what we're portraying in the show." The show will take place at 7:30 p.m. Friday and Saturday and Nov. 9 and 10 at the high school.